Bernd Friedmann reveals his true nature as an experimentalist, foresaking his more melodic work, for a 77 minute soundscape. 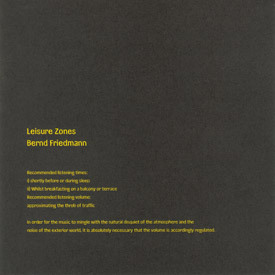 ‘Leisure Zones’ offers an alternative to the state many people find themselves in; as passive consumers of leisure. But the increasing inviability of this option due to environmental destruction will force us to modify this existence. The West is overloaded with used and unsold hardware; the very pile is threatening to topple over and crush us all. But the intimate world of auditory pleasure (including silence) presents an alternative to this miasma. Bernd Friedmann is from Cologne. Cologne is a large city on the Rhine (pop. = 1 million approx. ), originally founded by the Romans. It was virtually totally destroyed by heavy bombing in the Second World War by the R.A.F.. The city is dominated by the twin-spired thirteenth century cathedral, a major European tourist attraction, and the gothic town hall. Most of the buildings were rebuilt after the end of the war, and Cologne is now a flourishing port and industrial and commercial centre.